Velkommen til Reserve på Orange Tree ... en unik villa, der er blevet renoveret til de højeste, krævende standarder. Dette moderne indretning, opskalere villa henvender sig til kræsne gæster, der forventer det bedste og ønsker at have en ferieoplevelse i luksus, uden at betale ublu 5-stjernede hotel satser. Set i det rolige og prestigefyldte samfund af Orange Tree, er The Reserve bekvemt placeret tæt på alle de forlystelsesparker i Orlando-området. Det har fire soveværelser (to skibsførere) og tre badeværelser. Når du bor på villaen, kan du forvente andet end de bedste .... fladskærms-tv i alle værelser og et 55 tommer 4K TV i alrummet, WiFi, NETFLIX, Apple TV, SONY Bluetooth aktiveret lyd bar, loft fans i alle værelser, fine sengetøj, hotel kvalitet håndklæder, et executive køkken, helt nye grill, spillerum med en skifer billard / pool bord og XBOX 360 Kinect gaming system. En Mickey Mouse tema værelse er til rådighed efter anmodning for familier med yngre børn. Nyd privatlivets fred for dit sydvendt pool i en anlagt, indhegnet gård med ingen bageste naboer .... med fire liggestole og skyggefulde spisebord under en kølende loft fan. Reserve er en ægte oase i Florida's appelsinlunde ... dit sted under solen for at have en mest mindeværdig ferie. En lokal gym, er tilgængelig 24/7 inden for 3 miles af vores hjem. Du vil bemærke fra vores fotografier, at der ikke er svaner på senge, ingen frilly håndklæder, osv .... Dette er en luksus fritidshus. Spørg os om vores ejendom med alt inklusive, der adskiller os fra alle andre. Vi er overbeviste om, at du ikke vil blive skuffet over dit ophold på The Reserve. BEMÆRK - KONTAKT OS før en ONLINE RESERVATION. Alle tre badeværelser er blevet fuldstændig renoveret. Privat badeværelse har en stor smagfuldt indrettede flisebelagt walk-in brusekabine og et stort soaker karbad. Der er to håndvaske med hans og hendes spejle. De 2. Master og entre badeværelse har et badekar / brusekabine kombination, forfængelighed med et stort spejl. My family and I arrived to find the home spotless and extremely clean. The home was close to all the necessary conveniences, and only a 15 minute drive to our daily commute location for a college softball tournament in Clermont. My family found the home to be exactly what was needed at the end of the day. The Reserve at Orange Tree is a beautiful property and perfect for our two week stay in Orlando. The property is immaculately clean and tastefully furnished. Everything we needed was on hand and although we didn't particularly do any cooking whilst we were there, the kitchen was well equipped and there was also a BBQ outside. As a family of four there was plenty of room and everyone commented on how comfortable the beds were. The pool area was also great and the mesh canopy keeping all the animals and bugs out was brilliant for me as I tend to get bitten to death when I'm abroad! The boys loved the pool table in the converted garage which they used most evenings. Although we spent a lot of time away from the property visiting parks and shopping it was lovely to come back and feel completely relaxed and at home in our surroundings. I would definitely recommend this property to anyone wanting to visit the area and would like to say a big thank you to the owners, Ray and Julie, who were great in answering any questions we had and for keeping such a beautiful holiday home. We have recently stayed in the Villa with our family and found the hosts Ray and Julie to be professional in the smooth running of the booking, the duration of our stay and upon our return. 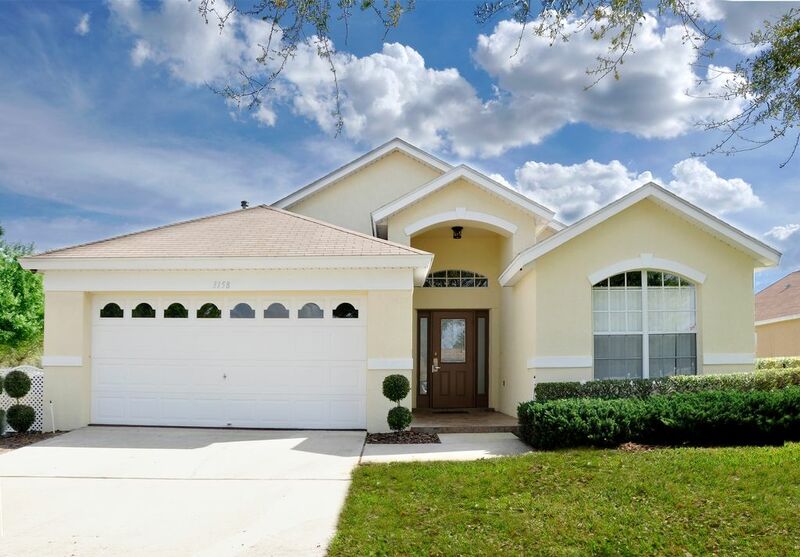 The Villa is located close to all amenities and within easy reach of Disney parks. We found the Villa to be clean and furnished to a high standard, far exceeding our expectations. Our stay there enhanced our enjoyment of a "holiday of a lifetime". We would have no hesitation to return there in the future. Rented this property for 11 days in March, 2018. All appliances are of very high quality and fairly new. There are many useful extra touches such as power strips in the bedrooms for charging devices and TV's in the bedrooms. a great vacation to their clients. Would gladly return here in the future. This was truly an amazing time for us and our 2 young grandchildren. Could not keep them out of the pool, There was every amenity available you could wish for, we did not want for anything. The Villa is beautifully furnished with such attention to detail and after a busy day at Disney and tea with Chef Mickey for my Grandsons birthday, that hot tub was paradise. They just loved the Mickey Mouse bedroom, it was Wow, Wow, Wow every minute. Pool Heat $25/night + tax (recommended from Oct to Apr) Please note that automated quote generated by Home Away are ESTIMATES only. Please contact owners for a formal quote.